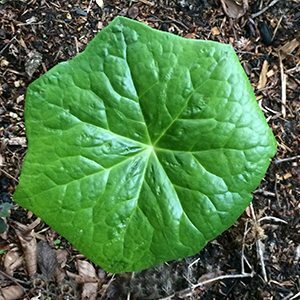 Simply a great foliage plant for shade, Podophyllum pleianthum has large glossy leaves, shallow lobed and very attractive. Sometimes called the Chinese Mayapple, the plant originates in China and nearby countries. The flowers are red and are mostly hidden below the leaves. This is a candidate to plant along a low retains wall in a shaded area where the flowers and foliage are raised closer to eye level. This is an outstanding foliage plant for shade. It is best planted where it has room to show off the foliage and also room to spread a little. Excellent in a shady courtyard grown in the ground or in a container. This is a plant for shade, it grows well in a humus rich moist soil and can be grown in containers. Provide moisture, good deep soil and shade and this is a very easy care plant. Ammend the soil before planting and water well through the first summer. Mulch around the plant with compost and some aged cow manure during winter. Mulch again once new growth appears and water with a a liquid seaweed fertiliser. Easy from seed, or by division of established clumps in winter while dormant. Te plant itself will naturally spread by underground rhizomes. Soil – Humus rich well draining soil. Flowers – Red, followed by red to yellow fruit and then seed pods. Flowering Time – Mid to Late Spring.